Small dairy farm operators in New York may soon be faced with the prohibition of winter spreading of manure by the State Department of Environmental Conservation. As an option to winter spreading, farmers considering updating barns or building new facilities can consider a bedded pack barn system for manure storage and animal comfort. There may also be government assistance to help build such a barn. Farmers who have used bedded packs will be featured at the NY Certified Organic (NYCO) meeting on January 8, 2019, beginning at 10 AM, in Jordan Hall, 630 West North Street, Cornell AgriTech, Geneva, NY. There is no cost or need to register to attend the NYCO winter meetings in January, February, and March. Participants are asked to bring a dish to pass at the potluck lunch. NYCO Winter Meeting Organizer and Cornell Cooperative Extension Small Dairy Specialist A. Fay Benson provides the following information on the two types of bedded pack systems with some pros and cons of each type and examples of one system in Vermont and one in New York. The Deep Bedded Pack (DBP) uses fresh bedding daily to keep the pack dry and clean. The pack grows to a depth of 5-6 feet by the end of one winter. The Composted Bedded Pack (CBP) requires the farmer to stirring once or twice a day with a tractor tractor-mounted rototiller. This system works best with wood shavings or chopped straw. The choice of pack depends upon each individual farm’s needs. Both systems have been used by confinement and grazing operations and with beef and dairy cows. Benson has seen CBPs mostly on grazing dairy operations using the barn only during the 150 days or so of the winter. A DBP system generally consists of a foundation of concrete or hard clay. Most DBPs use straw which is more absorbent than hay. DBP systems use more bedding, for example, one farm used 20 lbs. of straw/day/animal. As more manure and bedding are added daily, the pack grows deeper and requires strong retaining walls. DBP cleaning is more difficult due to the wetter, compressed material. CBPs have a foundation of concrete covered by a layer of thick wood chips to allow moisture and air movement at the base. Composting in the pack happens just as in a compost pile. When the pack has the correct carbon-nitrogen ratio and air is regularly introduced to the pack by stirring, microorganisms flourish and break down the carbon structures of bedding and manure. The main drawback to a CBP is the requirement of an expensive piece of rototilling equipment and the daily labor to run it. The bedding requirement for a CBP is less since stirring releases moisture to the air and the bedding is drier. Some CBP barns direct fans at the packs to increase drying. The CBP’s main benefits are less material to be spread and nutrients (N, P, & K) that are more stable in the compost and will not run off with water when applied to the land. Microbial activity in the CBP provides heat throughout the bedding for animal comfort through the winter. A farmer with a CBP barn in Vermont measured 60-80 degrees F up to 12 inches into the pack. For both types of bedded packs, side-retaining walls need to be strong enough to contain 4-6 feet of the pack and stand up to cleaning. As with any type of housing management, using adequate bedding, properly maintaining the bedding system, and consistently applying good milking and animal hygiene help manage the pathogens naturally found in a bedded pack system. Cow access, animal grouping, and travel-to-the-feed-alley patterns can be managed by electric fences. Cows make more manure in eating areas so daily scraping those areas will also help reduce manure in bedded areas. Good ventilation, whether the pack barn is positioned for natural wind ventilation or uses mechanical assistance with fans, helps keep cows healthy, the pack dry, and odors down. The open barn area of a bedded pack system allows for natural animal movement which will become increasingly important as animal care standards are implemented. Opinions differ on how much room should be allowed per cow; 85 to 100 sq. ft. per animal is usually the recommendation and is higher than for a freestall system. Breed, age, and animal condition impact that decision when planning a new barn. The general consensus is the more room, the better. The extra housing cost per animal is one reason BP barn structures are used more on smaller dairies. 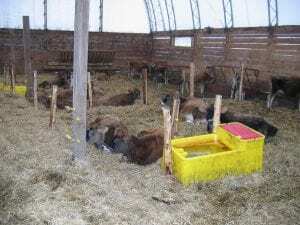 Bedded pack barns have been used in Vermont as a way for a smaller operation to build manure storage since the state prohibited winter spreading of manure in 1995. At his organic Butterworks Farm in Westfield, Jack Lazor used a DBP with three animal groups in a 60X120-foot barn. He separated them with electric fences suspended from the ceiling and raised as the pack grew. A 6-foot coil of water line inside water troughs unwound as the waterers rose with the pack. Jack used bale rings to feed baleage on the pack. Jack noted that the return for the significant expense of straw for the pack: $40-$45 every other day plus the labor of composting the pack, was in the positive effect on the soil and soil nutrients. Once the cows went out to pasture, Jack would usually remove the pack after first cutting. He left it in long, 6-foot-high windrows on a nearby field until after the last harvest. By leaving it for 3 months, the pack composted to reduce the amount to haul to fields for spreading. Jack reasoned that applying the aged manure in the fall mimicked nature applying carbon to the soil in the fall with dead leaves and grass. “Raw manure is hard on the soil and the environment; many of the nutrients are volatile or water soluble. By adding the extra carbon through the straw more of the volatile nutrients are captured and stored. Allowing them to go through the biological activity of composting, the nutrients are stabilized and won’t run off with significant rainfalls,” Jack said. In 2010, Super Milk producers Ben and Kate Whittemore of Dead End Farm, an 80-cow organic dairy in Candor, NY, built a 70×120-foot bedded pack barn with a 16-foot feed alley and 16-foot scrape alley. “Our cows loved the bedded pack barn with its thick, cushy bedding and wide open space to kick up their heels,” Kate Whittemore wrote in her farm blog, noting that most of the cows chose the bedded pack at night over the pasture. The Whittemores first used chopped hay in the pack since it was less expensive, but found it more labor intensive and not as dry. They switched to sawdust as easier to apply and easier to stir with their rotovator. Stirring three times a day improved the composting efficiency. and they could go more than a year between barn cleanouts. The Whittemores decided to add more animals and felt the best way to expand was to replace the bedded pack with free stalls. In 2014, they increased from 85 milkers to 120 milkers in the same barn. Because of the environmental benefits of a bedded pack system, the USDA Natural Resources Conservation Service (NRCS) may offer funding incentives for designs that pass their engineering specifications. Learn more by contacting your local NRCS office. The NRCS also has a 5-page Compost Bedded Pack Dairy Barns fact sheet, published in 2007, that is still relevant, as is an 18-page Bedded Pack Management System Case Study resource published in 2009 by a team with the Cornell University College of Agriculture and Life Sciences Department of Applied Economics and Management. For more information, Benson with Cornell University’s South Central NY Regional Team can be reached at 607-391-2660, afb3@cornell.edu.